I tend to have a pretty busy schedule filled with meetings, appointments, and travel engagements. Sometimes, it's hard to remember what events are coming up or when/where I'll be traveling. Thanks to Google Calendar notifications, I can control when I'll be reminded about upcoming events so I make sure I'm on time and I don't miss a flight! Once you have reached the notifications page, you'll see that you can set default reminders for this calendar. These reminders reflect the overall calendar and all the events that are placed on the calendar. If you create an individual calendar event on the specific calendar and create individual reminders (only for that event) ... those reminders will override any default reminders you have in place. 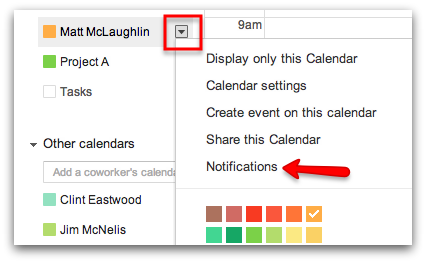 You can place up to five (5) reminders on each individual calendar event AND within the notification settings page. If you were invited to a calendar event on this specific calendar. If any event details were changed or adjusted. If the event/events were cancelled. You'll receive one of these notifications when/if people reply to your event invitation. Speaking of daily agenda, the last option in the image above is one of the coolest features associated with Google Calendar (personally). If you check the box to receive an email, everyday at 5:00am in your time zone, you'll receive a email message with the agenda for that day! There have been many mornings when I wake up and check my email on my cell phone, only to open the daily agenda email and discover that I have a pretty busy day ahead of me ... it's time to get cracking!! Be sure to go through and customize all of your calendar notifications ASAP ... so you don't miss another event!! If you found this article helpful and informative, give us a +1 so others can find this article as well. Also, if you have any general comments or suggestions for future blog posts, let us know in the comments section below!